The parathyroid is a small gland in the neck that is critical to maintaining proper calcium levels in the body. Lumps in the thyroid (thyroid nodules) or possible parathyroid cancer require the services of a cytopathologist for proper diagnosis. 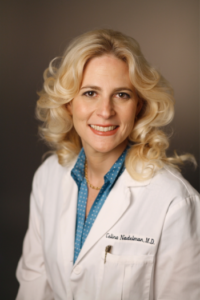 Dr. Celina Nadelman is a broad-certified cytopathologist and is the top choice for a biopsy doctor Los Angeles. Parathyroid lesions can be benign or malignant – non-cancerous or cancerous. In either case, it is not uncommon to encounter parathyroid tissue when evaluating specimens from the thyroid gland. It’s important to identify the various tissue and cell features to ensure a proper diagnosis and prevent inappropriate treatment. Samples may be obtained thorough fine needle aspiration (suction thorough a small needle) or through a core biopsy (punching out a section of tissue with a sharp, hollow tool). In many cases, a primary care physician discovers the lump, or nodule, in the thyroid gland. If the problem is in the parathyroid itself, lab tests will generally show hormone changes and an elevated serum calcium level. The primary care physician refers the patient to a specialist such as Dr. Nadelman. Cytopathology is a recognized medical specialty that requires additional training beyond the basics of both general medicine and pathology. Being board-certified means that the doctor has passed national examinations and also completes regular continuing education in the specialty. Fine needle aspiration (FNA) and core biopsy of the thyroid or parathyroid glands are office-based procedures. For the FNA, a small, thin needle is inserted into the thyroid or parathyroid gland through the skin. Imaging techniques or ultrasound may be used to ensure the correct location of the needle tip. Suction is applied to remove the tissue, which is then prepared on slides for examination under the microscope. The core biopsy is similar, but the tissue is contained inside the hollow tool rather than suctioned. In many cases, a cytopathologist can make a diagnosis within 24 hours, which helps prevent delays in treatment. There is no down time necessary for the procedure. If you have a thyroid nodule or a possible parathyroid lesion, Dr. Nadelman can help provide a timely, accurate diagnosis. As a biopsy doctor Los Angeles, she has the necessary qualifications and experience to meet your needs. She will also collaborate and coordinate with your primary care physician or surgical specialist as necessary.